Another milestone was reached yesterday as an Earthquakes season ticket holder mounted the very first seat at the new stadium. Using the occasion Quakes revealed new colour pattern for seats with a riddle hidden. 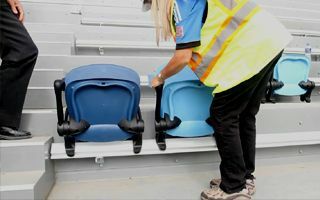 On Tuesday a small ceremony took place at Coleman Avenue in San Jose, where officials and media gathered to celebrate the installation of Earthquakes Stadium’s first seat. Four were mounted yesterday, while nearly 18,000 will be in place by late November, only leaving a small terrace for most vocal fans (Section 110). Each of the first four seats was put in place by an important figure. Club president Dave Kaval, defender Clarence Goodson and former US national Chris Dangerfield were there, but allowed someone else to take the first seat. It was Debbie Freeman, lucky season ticket holder for the new stadium. The ceremony was also attended by seat manufacturer Ken Griffiths of Camartic Seating. Using the opportunity, Earthquakes released a new rendering of the updated seating layout. Main colour remains unchanged, but the seats will present various shades of blue rather than a solid colour, creating a mosaic. Both seating patterns are presented below (previous one first). Also, several red seats were included in the south stand. What do they represent? That’s a riddle for fans to solve. Official announcement won’t come until the stadium is open next spring. Earthquakes have already sold 8,000 season tickets for the new stadium. The entire Section 110 is included in that number, just like all skyboxes and corporate seats included in the design.